I am not the qualified professional who will be using the products, but I would like to be able to order on behalf of my boss/agency/organization. How can I register and order online? Our website requires that the qualified professional on whose behalf you are ordering registers on our website first. Once he/she is registered, he/she can sign in and through his/her My Account page and provide us with your website log-in information (i.e., your name, e-mail address, and password). You will then receive a confirmation e-mail confirming that you are a registered agent and you can shop via our website on behalf of the qualified Customer. If you are unsure if the qualified professional on whose behalf you wish to order is registered, or if you have questions about getting established to order online as a purchasing agent/assistant, please Contact Us. I often order for my agency/business/institution, and there are numerous qualified professionals who work here. Because you seem to qualify individuals and not organizations, how am I able to order? Our website does require that you are associated with a qualified professional at your organization for purchasing purposes. In this way, we can abide by our guidelines in terms of the sale of testing materials to qualified professionals via our online shopping cart. If you wish to order online, we recommend having someone who supervises/oversees the use of the testing products at your organization register via our website so that he/she can provide us with your log-in details. I need to place an order quickly but I am unable to wait to have the qualified professional set up an online agent account for me. Is there another way I can place my order? You may place your order by phone, fax, or mail. Please see Ordering Information for further guidelines and a downloadable order form. I am already an agent. When I log in, I am not able to modify my billing address/login details. How can I do this? In an effort to protect account integrity for invoicing purposes, we do not allow you to modify the account billing address online for some account types. If a change is necessary in your log-in details or in your billing address information, please Contact Us. PAR, Inc. encourages the use of our proprietary tests in research projects. However, we do require that a formal written permission agreement be obtained from PAR prior to beginning the work if a modified version (including translations or use of tables, graphs, and/or text from the professional manual) or only a portion of the test is needed. PAR will not grant permission to include an entire test or scale in any publication, including dissertations and theses. However, inclusion of a few sample items may be approved. A per-copy royalty fee will be charged for all permissions granted. This fee is prorated based on the total amount of material you are using. A Permissions Fee will be charged for reproduction of tables, charts, graphs, or other materials to be included in other publications. Payment can be made in U.S. funds via check, money order, Visa, MasterCard, American Express, or Discover. If you are interested in requesting permission to use a modified form or portion of a test, please contact our Customer Support to obtain our Permission Request Form. Are all products listed in your online catalog published by PAR? Note: The Graduate Student Discount and Training Program Discount cannot be applied to the items above. Are PAR materials protected by copyright and trademark laws? All materials on this website are protected by copyright. This applies to website information and testing products and their components (including quoted material found in manuals, books, or brochures). Submitting a completed PAR Qualification Form and/or placing an order to purchase materials from PAR implies your acceptance of these terms and conditions. All trademarks, service marks, or registered trademarks appearing on the PAR website are the trademarks or service marks of their respective owners. For more information, please contact Customer Support. Do I need to request special permission in order to use a PAR published product? Using a translation. All of our translations have been approved. Back-translations have been conducted by an individual unfamiliar with the English version of the test and the back-translation has been forwarded to the author/PAR for review and approval. Including a few sample items or other materials (i.e., tables, charts, graphs) in a publication or appendix of a dissertation or thesis. PAR will not grant permission to include an entire test or scale in any publication, including dissertations and theses. If you plan to use a test in its entirety, please purchase the published version of the test. You may purchase the number of test protocols you will need for your intended purposes by contacting PAR Customer Support at 1.800.331.8378. Call 813.449.4065 if you are outside the U.S. or Canada. Copyright restrictions prohibit the photocopying of any materials purchased from PAR. How do I request permission to use a modified version or a translation of a PAR product? If you wish to use a modified version (including translations, modified format, use of tables, graphs, or text from a professional manual) of a PAR product, please download and complete the Permission Request Form. The completed form can be submitted to copyright@parinc.com for processing. Upon submission of a completed form, your request will be reviewed and we will contact you within 3-4 business days with instructions and information regarding associated costs. For online administration of our products, click here to download our Permission Request Form. Click here to view information regarding some of our available translations. When obtaining permission to use a modified/translated version of an instrument, it is recommended that you also purchase the professional manual for the English version so you will have the scoring and interpretive guidelines. You can also request a sample copy of the published test protocol at no additional charge with the purchase of the manual. Please contact PAR Customer Support at 1.800.331.8378 or 813.449.4065, or via e-mail at custsup@parinc.com for further information. How do I request permission to use a PAR assessment in an online format? If you wish to administer a PAR product online, please download and complete the Permission Request Form. The completed form can be submitted to copyright@parinc.com for processing. Upon submission of a completed form, your request will be reviewed and we will contact you within 3-4 business days with instructions and information regarding associated costs. When obtaining permission to use a modified/translated version of an instrument online, it is required that you also purchase the professional manual for the English version so that you will have the scoring and interpretive guidelines. You can also request a sample copy of the published test protocol at no additional charge with the purchase of the manual. Please contact PAR Customer Support at 1.800.331.8378 or 813.449.4065, or via e-mail at copyright@parinc.com for further information. What is PAR's position on the disclosure of my patient's data and/or results from your copyrighted test materials to nonqualified individuals? PAR's position is that Customers may not release copyrighted and confidential material to individuals not professionally qualified to obtain, review, and/or interpret them. PAR's instruments are trade secrets and protected by intellectual property laws including copyright and trade secret laws. Their usefulness and validity would be greatly compromised if they were available to the general public. We realize that clinicians are often called upon to provide test data and/or results from our assessments for legal purposes, possibly requested by opposing counsel, judges, or the patient himself/herself. In addition, many clinicians contact us with concerns that they will be asked to provide test data to patients in order to comply with the Privacy Rule of the Health Insurance Portability and Accountability Act (HIPAA). Click here to download PAR's official statement addressing these concerns. What is PAR’s position on the disclosure of test items or protocols, photocopying of any proprietary PAR test materials, trade secrets, copyright/fair use, the Family Education Rights and Privacy Act (FERPA), and the ethical considerations and possible litigation related to PAR’s assessments? To read the official PAR Position Regarding the Release and/or Photocopying of Test Materials, click here. Can I view e-Manuals on an e-reader or a tablet device like the iPad® or Motorola Xoom? e-Manuals from PAR can be downloaded and viewed on the iPad and on select Android tablets. PAR has tested and successfully downloaded e-Manuals on the iPad, iPad2, Motorola Xoom, and the Samsung Galaxy. Use of e-Manuals on these tablets requires you to download the free Bluefire Reader app onto your device. It may be possible to use on other Android tablets, but PAR is unable to guarantee compatibility and will only be able to provide limited support. Can you create bookmarks for specific pages? You can create bookmarks to specific pages. Once you are on a page you wish to bookmark, simply click the "Create Bookmark" button and add a note about the bookmark. To view any bookmarks you have created, click on the Bookmarks tab on the left side of the screen. How many times can I download an e-Manual? Each e-Manual you purchase is licensed for one user. We provide two download links per purchase. The second download link serves as a backup should you experience computer problems, replace your computer, or otherwise lose your original copy. Is it possible to print out the e-Manual if I want a hard copy? Because e-Manuals are in a DRM-protected format, printing is prohibited. The e-Manual can only be viewed on-screen on a PC with Adobe® Digital Editions installed or on an iPad or Android device through the Bluefire Reader app. Please purchase the print manual if you need a hard copy. Expedited shipping is available if you require the print manual quickly. Is it possible to search the e-Manual by key word? Yes, it is possible to search the e-Manuals by key word. Just type your search term in the "Find" box located in the upper right-hand corner. Is the e-Manual identical to the printed manual? Yes, all the information contained in the printed manual, including tables and graphs, is included in the digital version. What are the computer requirements for e-Manuals? Bluefire Reader can be installed to your iPad or Android tablet by searching for “Bluefire Reader” in the Apple App Store or Android Market. e-Manuals are provided in a DRM-protected format that is similar to PDF files. The protection provided in the digital environment prohibits printing and copying any portion of the manual. If you do not already have an Adobe.com login and Adobe Digital Editions software installed on your computer (or the Bluefire Reader app if using an iPad or Android tablet), you will need to download the software and create an account. The Adobe Digital Editions software is a secure platform that allows users to download and view electronic publications. Both the software and the Adobe.com account are available at no charge. You can install Digital Editions by clicking "Download Now" on the following website: http://www.adobe.com/products/digitaleditions/. What kind of products does PAR carry? PAR is a leading publisher of assessment instruments, software, books, and other related resources specifically developed to meet the needs of professionals in psychology, personality/counseling, neuropsychology, education, business and industry, forensics, human resources, and career counseling. Can anyone purchase materials from PAR? Each product listed in our online and print catalogs has an assigned Customer Qualification Level. Eligibility to purchase restricted materials is determined on the basis of education, training, and experience. For more information about our qualification process, please see the Qualification Levels section of this website. To register, please click here. If you are already qualified to purchase a Level B or Level C product, you are also qualified to purchase a Level S product. Where can I obtain additional information about one of your products? Our online and printed catalogs provide a general description of each of the products we sell. The best source for detailed information about product development, administration, scoring procedures, and psychometric qualities is the Professional Manual for that product. If you would like additional information about a product you have purchased, please contact our Customer Support. Our Customer Support Specialists are available EST, Monday through Friday from 8:00 a.m. to 6:30 p.m. You may call toll-free 1.800.331.8378 (U.S. & Canada) or fax toll-free 1.800.727.9329 (U.S. & Canada). All others may call 1.813.449.4065 or fax 1.813.961.2196. You can also contact Customer Support by e-mail. We will respond by the next business day. Does PAR offer free technical support? PAR provides technical support free of charge for all the products we sell (both print and software). Our Technical Support Specialists have extensive product knowledge and direct access to both programming and product development staff for prompt and accurate answers to your questions. Our Technical Support Specialists are available EST, Monday Friday from 8:00 a.m. to 6:30 p.m. You may call toll-free 1.800.899.8378 (U.S. & Canada) or fax toll-free 1.800.727.9329 (U.S. & Canada). All others may call 1.813.449.4066 or fax 1.813.961.2196. You can also contact Technical Support by e-mail. You will receive a response by the next business day. Does PAR offer scoring and reporting services for any of its products? PAR's Professional Report Service is available for several of our products. This process involves mailing the completed prepaid Answer Sheets to PAR. Reports will be processed the day they are received and will be returned to the test administrator on the next business day. I am not a graduate student or a college/university professor. Does PAR offer any type of discount if I use your products for research purposes? You may apply for research support in the use of PAR published products. All applications for research support require administrative review of the research project. PAR has established criteria for this evaluation process. Please e-mail Customer Support for instructions concerning how to submit a request for research support. How can I obtain a Price Quote so I can purchase the materials at a later date? When you order via our website, the checkout process of our online shopping cart enables you to generate a Price Quote instead of submitting your order with payment for processing. Click here to view saved price quotes (you must be logged in to save price quotes). Does PAR allow any modification or reproduction of their products? Due to copyright restrictions, photocopying of any PAR testing materials (in whole or in part) is prohibited. If you would like to obtain permission to reproduce or modify a product published by PAR, please see Copyright/Permissions for further information. How can I change my Customer Qualification Level? If you have received licensure from an appropriate agency or have additional training and experience that meets the requirements of a higher Qualification Level, you may update your Qualification Level in two ways. If you are registered on our website, please sign in. Once you are signed in, click on Update Qualifications on the right of the page in the PAR Shopping Cart to supply us with your additional information. If you are not currently registered on our website, you may send your update request directly to Customer Support. Be sure to include your current PAR Customer Number and all relevant information about your additional credentials. Do you carry foreign language versions of your products? Foreign language versions of several PAR products are available commercially. Click here for a list of these products. It is possible that if the product you are looking for is not on the list, a translation may be available by special copyright permission. Please e-mail Customer Support for information. Please include the name of the product and the foreign language you wish to obtain. Do any non-U.S. companies distribute PAR products? Yes, there are many foreign companies that distribute selected PAR products in other countries. Please see the list below for companies that distribute a wide array of PAR products or e-mail our Customer Support to obtain contact information for a distributor in your country. We encourage you to consult our distributors’ website for the availability and pricing of the products you are interested in; then, consider the impact of shipping costs, local duties, and taxes to determine the best source for your purchase. Additional distributors are available in other countries. Contact our Customer Support to obtain contact information for a distributor in your country. Does PAR offer discounts or coupons? PAR occasionally sends out promotional offers by e-mail or regular mail. Promotional offers cannot be combined with other discounts or offers and cannot be applied to prior orders. I am having difficulty finding PAR in my company’s vendor database. Does your company go by any other name? PAR stands for Psychological Assessment Resources, Inc. Over the years we have adopted PAR, Inc. as our main DBA, but in some vendor files, our company may be listed as Psychological Assessment Resources. For additional information, please see our W9. Click here to download. We realize that clinicians are often called upon to provide test data and/or results from our assessments for legal purposes, possibly requested by opposing counsel, judges, or the patient himself/herself. In addition, many clinicians contact us with concerns that they will be asked to provide test data to patients in order to comply with the Privacy Rule of the Health Insurance Portability and Accountability Act (HIPAA). If you would like to receive PAR's official statement addressing these concerns, please click here. How do I set up PAR software on my network? Using a network workstation, not the system console, you will need to install the program files to a network share and set them up to run on the local workstations. Configurations where the software runs on the server are not supported. On the server, create a share (or designate an existing share) where the program directory will be created during installation. Users will need "full control" permissions to the program directory. On each workstation, map a network drive to the share (e.g., Z:\ mapped to \\server\PAR). The path to the share must be the same for all workstations. From one of the workstations, install the software to a directory on that mapped drive (e.g., Z:\PAI Software Portfolio). Duplicate the program shortcuts (e.g., pointing to Z:\PAI Software Portfolio\PAI_main.exe) from this workstation on the other workstations. Running setup on the workstation verifies that the share is set up correctly and triggers the network install configuration (installing from the console of the server would create a locally installed license, making it inaccessible from the workstations). How many users can PAR software support? Each software license (purchase) is limited to a single user at any given time. The license can be tied to a single computer by installing the software locally, or shared among multiple users by installing it to a network share. When a shared license is in use, other users attempting to run the program will be notified that it is temporarily unavailable. If simultaneous access is required, we recommend you purchase multiple copies and install them in different locations. What file and system permissions are required for PAR software? As with most programs, Administrator permissions are required to successfully install PAR software. Once installed, most PAR programs will run for users with the default permissions of the user group. For older programs, or if permissions have been changed from the defaults, it may be necessary to grant "full control" permissions to the user for the program installation directory and contents. Will PAR programs run on a network? Most current PAR software can be installed in a network environment, to provide access for multiple workstations. Please contact our Technical Support department if you have any difficulties with specific programs; some older programs may require an upgrade to support network installs. How do I place an order with PAR? To place an online order with PAR, we ask that you complete the website Registration process before shopping. See Registration Help for instructions. You can click on Register to begin the process. Please note that you may update your information online whenever a change is appropriate. Password protection ensures that you are the only person who has access to your personal information. There are other convenient ways to place your order with PAR. Call toll-free 1.800.331.8378 (U.S., Canada, U.S. Virgin Islands, Puerto Rico, and Guam) or via our International Toll-Free Numbers, Monday through Friday from 8:00 a.m. to 6:30 p.m., EST. All others, call 1.813.449.4065. Fax toll-free 1.800.727.9329 (U.S. & Canada). All others, fax 813.961.2196. For your convenience, you may also print out this Customer Reference Sheet (PDF). It contains PAR contact information and a notes section to record information that may be helpful when placing orders. This sheet is for your reference only and is not required to be sent to PAR. Virtually 99% of the products in our catalog are in stock at all times. Orders received by 6:00 p.m., EST (5:55 p.m. EST for orders placed on the website), Monday through Friday will be shipped that same day (except for holidays). All other orders will be shipped on the next business day. We will use the shipping method you select. How safe is it to place an online order using my credit card? It's just as safe as any credit card purchase you place by phone or in person. Our website features advanced TLS 1.2 encryption technology that ensures the security and privacy of your transaction. Basic Ground/Regular service to U.S. destinations takes about 4-10 business days. For faster service, Priority, Overnight, and 2nd-Day Air delivery are available. Saturday delivery is available in some areas, please call Customer Support for more information. Basic Ground service to destinations in Canada, the U.S. Virgin Islands, Puerto Rico, and Guam takes about 7-14 business days. Expedited service is available. Regular service to International destinations takes 2 or more weeks. Expedited service is available. For complete information about anticipated delivery times, available shipping methods, and shipping and handling rates, click on Shipping/Handling Information. What are your payment requirements for orders? Individuals must prepay their orders in U.S. funds with a personal or bank check, money order, wire transfer, or one of the following credit cards: American Express, Visa, MasterCard, or Discover. If you are a new Customer, our website requires prepayment by credit card, although you can generate a price quote through our shopping cart if you wish to pay by check or money order at a later time. Companies, institutions, or other business entities within the U.S., Canada, Puerto Rico, and the U.S. Virgin Islands can use a Purchase Order. Prior approval from PAR is necessary to establish the ability to use Purchase Orders. Purchase Orders submitted by mail or fax to PAR should specify net 30, F.O.B. Lutz, or F.O.B. Shipping Point. Please contact Customer Support if you have any questions about using a Purchase Order. This is my first order; do you require information regarding my professional experience and eligibility to purchase your products? Yes. In accordance with the Standards for Educational and Psychological Testing and PAR's competency-based qualification guidelines, many tests and materials sold by PAR are available only to those professionals who are appropriately trained to administer, score, and interpret psychological tests. Eligibility to purchase restricted materials is determined on the basis of training, education, and experience. If you would like to see more information regarding our qualification guidelines, see the Qualification Levels FAQ page. Does PAR accept payments made via wire transfer? Yes. If you are an international Customer and need information regarding how to remit payment via a wire transfer, please contact PAR Customer Support. We will be happy to provide that information to you, as well as other information concerning your order and shipment. Your personal information is completely confidential and will never be rented or sold. We will use your information to make your online shopping experience as easy as possible. The website will recognize you each time you visit, and you will not need to re-enter your personal information. Each order you place becomes part of your Customer history with PAR. PAR also gathers summary statistics (non-personal information about the number of people who visit our website and the particular sections of the website they visit). This information is used in website planning and maintenance activities and helps us to improve the services we provide. What is PAR's taxpayer ID number? PAR's taxpayer ID number is 59-1913294. PAR stands for Psychological Assessment Resources, Inc. Over the years we have adopted PAR, Inc. as our main DBA, but in some vendor files, our company may be listed as Psychological Assessment Resources. For additional information, please see our W9. I ordered the wrong item by mistake. Can I exchange it for another item? We accept the return of any print or software item purchased from PAR. Returns made within one year will receive the full item price. For items returned within 45 days, the cost of ground/regular shipping and handling charges will also be refunded. Please return the merchandise in resalable condition with a copy of your invoice. Software returns must be made within 90 days. PAR reserves the right to charge a restocking fee on products returned more than one year after the purchase date and to assess a service charge on any stopwatch or other equipment returned without its original box. PAR reserves the right to apply further return restrictions for products that have a newer edition available. Refer to the product page for the product’s return policy or contact Customer Support for a list of these products. What is your No-Risk Guarantee? We accept the return of any print item purchased from PAR. Returns made within one year will receive the full item price. For items returned within 45 days, the cost of ground/regular shipping and handling charges will also be refunded. Please return the merchandise in resalable condition with a copy of your invoice. Software returns must be made within 90 days. PAR reserves the right to charge a restocking fee on products returned more than one year after the purchase date and to assess a service charge on any stopwatch or other equipment returned without its original box. PAR reserves the right to apply further return restrictions for products that have a newer edition available. Refer to the product page for the product’s return policy or contact Customer Support for a list of these products. .
What documentation needs to accompany my return? A copy of your original invoice/shipment packing slip. If you do not have a copy of the invoice, please reference your personal/business/institution order reference number (e.g., purchase order number) and provide the complete address to which your order was originally shipped. A note including your name, company name, complete address and telephone contact information, and the reason for your return. The item I received is damaged or defective. Do I have to pay to return it to PAR? If you received an item that was damaged or defective, please contact our Customer Support or by phone at 1.800.331.8378 (U.S. & Canada) or 1.813.449.4065. We will be happy to assist you in obtaining a replacement, and we can arrange for a pickup of the damaged or defective merchandise. Where and how should I return merchandise to PAR? Return your merchandise via a traceable method (e.g., UPS, FedEx, or Certified) to our Distribution Center, Attention: Returns, PAR, Inc., 16130 N. Florida Ave., Lutz, FL 33549. NOTE: PAR is not responsible for the loss of merchandise that is returned via a non-traceable shipment method (e.g., regular postal service). Does PAR require prior return authorization after 90 days from the date of purchase? Prior authorization should be obtained for returns after 90 days from the date of your invoice. Failure to obtain prior approval may result in a delay in processing your return. To obtain prior authorization, simply e-mail our Customer Support. PAR reserves the right to charge a restocking fee on products returned more than one year after the purchase date. After your returned merchandise is received in resalable condition at our Distribution Center, please allow at least 7 business days for processing. After your return is processed, an Accounting Specialist will mail you a Credit Memo statement contains the details of your refund. Note: Credit Memo statements for international Customers will arrive by mail within a few weeks. To check the status of a return, e-mail Customer Support. Be sure to include your name and the invoice/order reference number in your e-mail. You will receive a response by the next business day. Does PAR charge a restocking fee? Returns after one (1) year require prior authorization and are subject to a 20% restocking fee. Bookstore returns require prior authorization after 6 months from the date of the invoice and are then subject to a 20% restocking fee. PAR reserves the right to assess a restocking charge for quantity item returns. What type of refund will I receive? Refund processing depends on the original payment method. Refunds for payments by credit card will be credited to the card used. Refunds for payments by business or personal check, money order, or bank transfer will be issued in the form of a check. Refunds for purchase orders for which payment has already been made will also be issued in the form of a check. Refunds for purchase orders for which payment has not yet been made will be issued in the form of a credit to the purchase invoice. I recently purchased a new version of one of your tests. What should I do with unused and obsolete test protocols and materials from the prior version of the instrument? PAR recommends that you destroy and discard the obsolete materials in a secure manner. If you or your institution does not have ready access to a secure recycling program, we are happy to obtain the materials from you and discard them through our own corporate recycling program. Simply e-mail or call our Customer Support at 1.800.331.8378, and a specialist will be happy to issue a prepaid return label to retrieve the obsolete materials for proper disposal (available to USA Customers only). What are the requirements for PAR software? Current PAR programs are supported on Windows® XP, Vista®, or 7. Installation requires a CD-ROM drive, and activation requires either a connection to the Internet or a telephone. The software must be installed to a drive/partition with an NTFS file system; other file systems such as FAT are not supported. Do your programs run on Mac computers? Although PAR does not officially support our software on Mac computers, many Customers have had success using our programs on Macs that have installed a copy of Windows XP or Vista or 7 using Apple® Boot Camp. With Windows and Boot Camp, you can boot the Mac in full Windows mode and have full Windows functionality, allowing PAR software to run effectively. You must choose the NTFS file system for the Windows partition of your hard drive when installing Windows. Although Apple offers other methods of running selected Windows software on Macs, only Macs with Boot Camp and an installed version of XP or Vista or 7 have the Windows functionality required to run PAR software. Specifically, Parallels Desktop for Mac will NOT run PAR software. For more information about Boot Camp and Windows, contact your Apple dealer or visit the Apple website at http://www.apple.com/support/bootcamp/. NTFS is a file system that is included with Windows 2000/XP/Vista to improve reliability, performance, and security of data stored on the drive. Windows 2000, XP, and Vista and 7 systems are usually preconfigured with NTFS for the hard drive, although older file systems such as FAT32 are still used for smaller drives (e.g., USB flash drives). How can I tell if I have NTFS? Right-click the drive where you want to install and select Properties. The file system is listed below the label and type of drive. What can I do if C: isn’t an NTFS drive? If you have another drive with NTFS, you can install the program to that drive. After reading the license agreement, click Browse and substitute the drive letter for C: (e.g., D:\Program Files\PAI Software Portfolio). How can I view my invoices on your website? When signed into our website, from the My Account section, click on Invoice History. By default, any invoices created within the last 60 days will be listed. You can search for older invoices by typing the invoice number into the Quick Search box. Invoice numbers are usually six digits and will end with a hyphen and a 1-digit number. Alternatively, you can search for invoices by date. To change the date range, click on the calendar icons next to the dates listed. The calendar dialog boxes enable you to choose specific dates (use the arrows at the top of the months to move forward or back one month at a time). Note that only the last 3 years of order history can be viewed online. For older sales history, please contact our Customer Support. How can I view my sales orders on your website? From the My Account section, click on Sales Order History. By default, any Sales Orders created within the last 60 days will be listed. You can search for older sales orders by typing the sales order number into the Quick Search box. Sales order numbers are usually 6-digit numbers. Alternatively, you can search for sales orders by date. To change the date range, click on the calendar icons next to the dates listed. The calendar dialog boxes enable you to choose specific dates (use the arrows at the top of the months to move forward or back one month at a time). Note that only the last 3 years of order history can be viewed online. For older sales history, please contact our Customer Support. Can I place an order without signing in and/or registering? You may not place an order on our website without registering and/or signing in. However, you may use our website to obtain item descriptions, item numbers, and prices and then fax or mail your online shopping cart to us. To do so, fill your shopping cart as if you were going to place an online order. On the bottom of the shopping cart page, select the appropriate Quick Order Form for your location. Your items will automatically appear on the Quick Order Form (you may enter additional item numbers and quantities at this time; the website will automatically fill in the descriptions and current prices after you click “Update”). Print the form. Manually calculate the shipping and handling costs (and taxes, if applicable) using the guidelines provided, and provide the billing, shipping, and payment information needed to complete the order. Then fax or mail the form to PAR (our fax number and mailing address appear on the printed form). Caution: Once you print and close the form, you will not be able to retrieve the item information. If you need to include more items, write them in the Additional Items section and update the order subtotal. How do I convert a saved quote to an order? 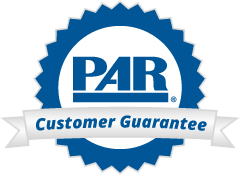 To convert a quote to an order, sign in to the PAR website and click on My Account in the PAR shopping cart in the top right-hand corner of the screen. Click on View Sales Quotes, which is located in the Account Tools section. To view an existing quote, click on the Quote Number, which will start with a W, T, or D and have 4 or 5 digits. After you have opened the correct quote, click the Convert to Order button. You will be taken to the checkout screen, where you can edit your address information and shipping options and enter your payment information. How do I use the Quick Order Form located in the shopping cart? This form can be used if you prefer to fax or mail your order. On the bottom of the shopping cart page, select the appropriate Quick Order Form for your location. Enter your item numbers and quantities in the appropriate spaces and click "Update;" the website will automatically fill in the descriptions and current prices. (If your shopping cart contained items, they will automatically appear on the Quick Order Form.) Print the form. Manually calculate the shipping and handling costs (and taxes, if applicable) using the guidelines provided, and provide the billing, shipping, and payment information needed to complete the order. Then fax or mail the form to PAR (our mailing address and fax number appear on the printed form). Caution: Once you print and close the form, you will not be able to retrieve the item information. If you need to include more items, write them in the Additional Items section and update the order subtotal. What is the difference between Sales Order History and Invoice History? Each order placed will have a sales order number and one or more invoice number(s). Sales order numbers correspond to the entire order, including items that were placed at the same time but shipped separately. Invoices correspond to each separate shipment that is part of an order and indicate what was formally billed (i.e., if paid by Purchase Order) or charged (i.e., if paid by credit card). Each shipment will have its own invoice. Because 99% of our items are in stock at all times, it is rare that more than one invoice (i.e., shipment) will correspond to each sales order. See How can I view my invoices on your website? for information on how to view invoices and sales orders on our website. How do I create a quote on your website? You can use our website to generate an official price quote, including shipping and handling, that can be printed out or converted to an order at a later time. This feature can be useful when you need to issue a purchase order or pay later by check or wire transfer. To create a quote, add one or more items to your cart by clicking the shopping cart icon next to each item. Click on View Full Shopping Cart, located at the bottom of the scrolling PAR shopping cart in the upper right-hand corner of your screen. Then, click Save as Quote, which will instantly create a quote using your default address and the regular shipping method. Alternatively, if you would like to alter your shipping address or the shipping method on your quote, you can do so on the checkout screen. For more information on how to open your quote on the checkout screen, please see How do I convert a saved quote to an order? When you are on the checkout screen, you can edit your shipping address and method and save your changes by clicking the Save Quote button at the very bottom of the screen. Are there any setup or yearly licensing fees or costs? No. With PARiConnect, you only pay for the administrations and reports you need. i-Admins and Reports are sold in sets of five, so you can try a new test without a large initial investment. Can I re-run a report for the same client and test administration without using a report counter? Yes, you can regenerate reports without depleting your report inventory. Although PARiConnect requires you to purchase report uses for each type of report for each instrument assessed, you can generate the same report multiple times using different norms or demographics without using up an additional report—and regenerated reports are saved individually, not overwritten on the original. Can the Account Supervisor limit which parts of iConnect can be accessed by other users on the account? PARiConnect can be customized for one of three types of users, as described below. Each type of user has a different level of permissions and therefore a different level of access to specific screens, paths, and sensitive client information. Does the system offer any data verification options? Yes. PARiConnect offers two options for verifying item responses quickly and easily. In the manual method, you re-enter item responses in a second column; the system marks any variances and allows you to correct the data. In the automatic method, the computer audibly reads back the client responses item by item so you can verify their accuracy and correct any mistakes. How can I order more i-Admins or Reports? Additional uses can be ordered directly through parinc.com or by phone, fax, or mail. If you will be ordering via phone, fax, or mail, please reference the Customer number and the name of the PARiConnect Account Supervisor so we can be sure to properly assign the purchased uses. How can my organization change the Account Supervisor? PAR Customer Support will need to speak with the new Account Supervisor to verify his or her qualifications. We will also need a letter requesting the change printed on company letterhead. You can print this letter on your company’s letterhead and e-mail it to cs@parinc.com or fax it to 1.800.727.9329 with the required information. How do I obtain access to PARiConnect? If you already have an e-mail address and password at parinc.com, please review the Account Supervisor Agreement, then call 1.855.856.4266. A friendly Customer Support Specialist will help you set up your PARiConnect account. If you are a new PAR Customer, or you are an existing PAR Customer who doesn’t have a parinc.com account, please register first. When you have finished creating your parinc.com account, please review the Account Supervisor Agreement, and then call 1.855.856.4266. A friendly Customer Support Specialist will help you set up your PARiConnect account. Is PARiConnect secure? Is my client data safe? PARiConnect was designed with HIPAA compliance in mind. At PAR, we understand that laws are changing, technology is changing—and, as a result, your practice has to evolve. The safekeeping of sensitive information is extremely important to us. In fact, it has been at the top of our list as we designed PARiConnect. Your transmissions are protected with TLS 1.2 encryption, and all internal PARiConnect communications are performed behind a firewall. In addition, PAR is EU-U.S. Privacy Shield Framework compliant, certified to adhere to privacy and security principles outlined by the U.S. Department of Commerce. All systems are hosted at a Peak 10 data center that is centrally located to our U.S. Customer base. For more information on the security credentials of this data center, visit this page. Three administration options are offered: on-screen, remote, and paper-and-pencil. On screen: PARiConnect is a client-centric system, so it’s as simple as setting up a client file and assigning the appropriate assessment to your client. After administration, you’ll be able to review and verify his or her responses and view the report. Print reports or download them to your desktop for easy editing. Remote administration: The system allows you to e-mail an invitation to complete an assessment to anyone with an e-mail address. Once the client receives the invitation, he or she simply clicks on the link in the e-mail and takes the test. You’ll be notified immediately after the administration is complete. Quickly verify responses and run, edit, and print reports. Paper-and-pencil: PARiConnect enables you to easily populate test forms with item responses and quickly get reports. Use your keyboard or mouse to enter item responses on a screen that replicates the look of the printed form; a unique magnifying box allows you to “zoom in” on each item row for easier viewing. There’s no need to purchase i-Admins for tests you don’t administer using PARiConnect—you just pay for the reports you generate. What is PAR’s position on telemedicine and remote assessment administration? Telemedicine, also known as telehealth or telepractice, uses telecommunication technology (such as telephones, Internet sites, videoconference sites, social media, and e-mail) to deliver communications to and from practitioners and patients. Psychologists should use their best judgment when determining if and when assessment tools are appropriate for use in the practice of telemedicine. Further, they should check local laws and regulations specific to their geographic location and should refer to APA's guidelines for telepsychology and their professional associations for guidance. PARiConnect is a secure Internet platform that enables users to administer various PAR assessments and receive reports online. Assessment results can be obtained in three different ways: through administration of an on-screen, in-office assessment; through an on-screen, remote administration using the client’s computer; or through hand-entry of responses already obtained from a paper-and-pencil administration. PARiConnect provides similar reports as those offered by the desktop versions of the software, including score reports, interpretive reports, and other types of reports, depending on the assessment administered and the options available. Reports are initially generated on-screen, but may also be printed or saved to your desktop. The version of the report saved to your desktop is a Rich Text Format (RTF) and may be edited in a word processing program such as Microsoft® Word, enabling you to add your own notes and observations to the report. You must create a PARiConnect log-in ID and password when you establish your PARiConnect account. What is the difference between a Score Report and an Interpretive Report? Score reports provide scoring and validity information only. Interpretive reports provide scoring and validity information plus in-depth descriptions of assessment results. What tests are currently available on PARiConnect? When will other tests be added? To view the current list of products available on PARiConnect, please visit PARiConnect. New assessments are being added on an ongoing basis. Are PAR materials protected by copyright? Are foreign language versions of any PAR products available? Can I photocopy or modify one of your products for use in my college course? Due to copyright restrictions, photocopying or modifying PAR materials (in whole or in part) is strictly prohibited. It is possible to request special permission to use PAR copyrighted materials in a publication or special presentation, or as part of a thesis or dissertation. Send your request to Customer Support. Please include the name of the product you are interested in. You will receive a response, including instructions for submitting a formal permission request, by the next business day. Where can I find more detailed information about the psychometric properties of a specific product listed on this website or in your printed catalog? You will find a general description of the product in this online catalog and in the printed catalog. The best source of comprehensive information about the development, administration, scoring, psychometric properties, and appropriate uses of a product is the product manual. You can use the search feature to search for a product by title, acronym, author, construct, or item number. When searching by item code, be sure to leave out the catalog item number prefix and suffix. Simply enter the bold number printed in the catalog. For example, enter 2025 instead of 9A-2025-KT. Are software versions available for PAR products? PAR publishes assessment, scoring, and interpretation software for many of our products. We recommend that you search for the product you are interested in. In most cases, software sample reports are available. If I purchase software from PAR, will I be notified of any future updates or upgrades to that product? If an upgrade occurs, the new version will be listed in this online catalog and purchasers of the previous version will be notified by mail. Individuals who purchased the earlier version of the product within the 90 days prior to the new release may request a complimentary copy of the upgraded version. Other previous purchasers will have an opportunity to upgrade to the new version at a significant cost saving. Does PAR offer free Technical Support for its products? As part of our commitment to provide unparalleled Customer Support, PAR offers free Technical Support for all of our print and software products. Our Technical Support Specialists have extensive product knowledge and direct access to programming and product development professionals for prompt and accurate answers to your questions. Our Technical Support Specialists are available Monday through Friday from 8:00 a.m. to 6:30 p.m., EST. You may call toll-free 1.800.899.8378 (U.S. & Canada) or fax toll-free 1.800.727.9329 (U.S. & Canada). All others may call 1.813.449.4066, or fax 1.813.961.2196. You can also contact Technical Support by e-mail. You will receive a response by the next business day. Yes, there are many foreign companies that distribute selected PAR products in other countries. Please see the list below for companies that distribute a wide array of PAR products or e-mail our Customer Support to obtain contact information for a distributor in your country. We encourage you to consult our distributors’ websites for the availability and pricing of the products you are interested in; then, consider the impact of shipping costs, local duties, and taxes to determine the best source for your purchase. Does PAR offer workshops on the appropriate uses of any of its products? To view the product workshops currently sponsored by PAR, click on Conferences/Workshops. Click here to arrange a product training workshop at your location. How can I help PAR develop new products? For information about publishing opportunities with PAR or about becoming a data collector or field tester for one of our upcoming product releases, please refer to the Opportunities section of this website. What are the requirements for the different Qualification Levels? In accordance with the Standards for Educational and Psychological Testing and PAR's competency-based qualification guidelines, many tests and materials sold by PAR are available only to those professionals who are appropriately trained to administer, score, and interpret psychological tests. Eligibility to purchase restricted materials is determined on the basis of training, education, and experience. Certain healthcare providers may be eligible to purchase selected B and C level instruments within their area of expertise. Specifically, relevant supervised clinical experience using tests (i.e., internship, residency) in combination with formal coursework (i.e., tests and measurement, individual assessment, or equivalent) qualifies a healthcare provider to purchase certain restricted products. You may not place an order on our website without registering and/or signing in. However, you may use our website to obtain item descriptions, item numbers, and prices and then fax or mail your online shopping cart or Quick Order Form to us. Please see the entry below for full instructions on using the Quick Order Form. This form can be used if you prefer to fax or mail your order. On the bottom of the shopping cart page, select the appropriate Quick Order Form for your location. Enter your item numbers and quantities in the appropriate spaces and click “Update;” the website will automatically fill in the descriptions and current prices. (If your shopping cart contained items, they will automatically appear on the Quick Order Form.) Print the form. Manually calculate the shipping and handling costs (and taxes, if applicable) using the guidelines provided, and provide the billing, shipping, and payment information needed to complete the order. Then fax or mail the form to PAR (our mailing address and fax number appear on the printed form). Caution: Once you print and close the form, you will not be able to retrieve the item information. If you need to include more items, write them in the Additional Items section and update the order subtotal. Registration is required to use our online shopping cart and account management features. The information you supply when registering will be stored in our secure website database. Password protection ensures that you are the only person who has access to your personal information. If you are a purchasing agent/assistant and not the individual using or overseeing the use of the assessment products you are purchasing, please see our Agent/Assistant Help. How do I qualify for a training discount? We offer two separate training discount programs. To qualify, you must be a professor/educator teaching a course, or a professional who is teaching/supervising in an internship or clinical practicum program in which you are training students in appropriate professional use of PAR published products. In addition, you must complete and submit the most appropriate training program discount order form, along with any additional documentation that is requested. Download and complete the PAR Clinical Training Program Discount Order Form (requires Adobe® Reader® to view), if you are conducting training with any of our proprietary assessment instruments in clinical programs that utilize practicums, internships, or post-doctoral positions. This is the most appropriate form for clinical training programs that are experiential in nature and take place outside of university/college settings. Examples include hospitals, clinics, etc. Download and complete the PAR Educational Training Program Discount Order Form (requires Adobe® Reader® to view), if you are using any of our proprietary assessment instruments for training or educational purposes in college or university courses. This is the most appropriate form if the training will take place at a College/University and an official course number is associated with the training. Once you download and complete the appropriate form, making sure to complete the 2nd page “order form” which lists the items you wish to order, you may submit the form to PAR by fax, mail, or e-mail. Are all the products listed in your online or print catalogs eligible for the graduate student and/or training discounts? Not all of the products in our online or print catalogs are eligible for these discounts. Only products published by PAR are eligible for the discount. On our website, all products ineligible for a discount will be labeled with the following message: "Note: The Graduate Student Discount and Training Program Discount cannot be applied to the items above." Before you place an order, please e-mail Customer Support to verify that the specific product(s) you wish to purchase is/are eligible for the discount. Click here for the Graduate Student Discount Form. Do I have to submit a new Training Program Discount Order Form each time I place an order? If you are reordering the same materials you specified in your original application, and you submitted a form within the last 12 months, you do not need to submit another form. Simply mail or fax your order. If you plan to order materials not specified in your original request, or it has been 12 months since you last submitted either the Clinical or Educational Training Discount Order Form, you will need to download, complete, and submit a new PAR Clinical or Educational Training Program Discount Order Form (requires Adobe® Reader® to view). Do I need to submit a new Graduate Student Discount Order Form each time I place an order? If you are reordering the exact materials you specified in your original application, you do not need to submit another form. If you are ordering a product that was not specified on your original application, you will need to download, complete, and submit the PAR Graduate Student Discount Order Form by fax or mail (requires Adobe® Reader® to view), or e-mail Customer Support, specify the new materials you wish to order, and request a new copy of the Graduate Student Discount Order Form. Complete and submit the revised copy of the form with your order. How do I calculate the exact amount of my student or training discount order? Simply deduct the appropriate percentage from your order subtotal, add appropriate tax (if any), and add shipping and handling charges based on the discounted subtotal. All payments should be issued in U.S. funds. If you have any questions about your order, please e-mail Customer Support. Discount Order Forms will be processed by the next business day. I am a graduate student; can I get a sample of one of your products to evaluate for use in my research project? In many cases, graduate students can qualify to purchase a product manual and request a complimentary sample copy of the actual instrument. The product manual provides vital information about the development, administration, scoring, interpretation, psychometric properties, and appropriate uses of the product that will help you evaluate whether the product will meet your research needs. Be sure you request the product sample, because it does not automatically come with the manual. If you decide that the product is not appropriate for your research, you may return it for a full refund. For more information, contact Customer Support for specific instructions about obtaining special copyright permission for this purpose. Can I purchase testing materials and then photocopy them for use in my research project? Copyright restrictions prohibit the photocopying of any materials purchased from PAR. If you plan to administer the entire test, you must purchase the number of test protocols you need. If you plan to modify the instrument in any way for your research project (e.g., change wording, omit certain items, use a different answer sheet, translate into another language), e-mail Customer Support for specific instructions about obtaining special copyright permission for this purpose. Can my college/university order the materials on my behalf using a purchase order? Your purchasing department must submit your Educational Training Program Discount Order Form along with the purchase order (either for the full amount of the products or adjusted to reflect the percentage discount). We will invoice the college/university for the adjusted amount. If there is any problem with your application or your order, a Customer Support Specialist will contact you or your purchasing department by phone or e-mail. What kind of a discount do you offer for graduate student research? PAR offers a 40% discount to graduate students who use one or more of the products we publish in graduate research projects (e.g., master's thesis or dissertation research). Click here for the Graduate Student Discount Order Form. Please note that this discount cannot be obtained when purchasing via our website. How do I qualify for the graduate student discount? To apply for the discount, download, complete, and submit the PAR Graduate Student Discount Order Form by fax or mail (requires Adobe® Reader® to view), or e-mail Customer Support and request a copy of the form. This form requires you to list the specific items you wish to order, provide specific information about your research project, and include the signature of your supervising professor as proof that you are conducting a supervised research project. Complete the form and submit it with your order for eligible products subtotaling $50 or more (before the discount). How will PAR use my information? PAR, Inc. respects your privacy. The information you provide will never be rented or sold. PAR, Inc. will use the contact information you provide for internal purposes, such as confirming and tracking your order; subscription or registration; analyzing preferences, trends, and statistics; and informing you of our new products, services, and offers. We also may disclose information to outside companies that help us bring you the products and services we offer. For example, we may work with an outside company to (a) manage our database of Customer information, (b) assist us in distributing e-mails, (c) assist us with direct marketing and data collection, (d) provide storage and analysis, (d) provide fraud prevention, and (e) perform other services designed to assist us in maximizing our business potential. We require that these outside companies agree to keep confidential all information we share with them and to use the information only to perform duties specified in our agreements with them. If you prefer not to have your information shared with these organizations, please contact us by telephone at 1.800.331.8378, by e-mail at custsup@parinc.com, or by written notice to PAR, Inc., 16204 N. Florida Ave., Lutz, FL 33549. If you would like to opt out of PAR, Inc. direct mail advertising, please send your complete name and address indicating your desire to opt out to PAR, Inc., 16204 N. Florida Ave., Lutz, FL 33549. Is www.parinc.com a secure website? PAR is committed to providing you with a secure online ordering environment. Information received on our website will be used solely by PAR, Inc. or its agents for internal purposes (e.g., confirming and tracking your order, registration, analyzing trends and statistics); it will not be sold or otherwise transferred to third parties. PAR uses TLS 1.2 technology—the most widely used system for Internet encryption. We use this system to protect your personal and identifiable information, such as your credit card number, from unauthorized use, access, modification, or disclosure. PAR offers same-day shipping for all orders received Monday through Friday by 6:00 p.m., EST (5:55 p.m. EST for orders placed on the website). Orders received later in the evening or on weekends or holidays will be shipped the next regular business day. Shipping and handling charges will appear as a separate item on your invoice. This charge includes secure packaging, insurance, and rapid processing of your order. Rates and delivery times are based on the destination and the specific shipping method you select for your order. Orders placed online will receive an e-mail confirmation with an order reference number. For further information about the status of your order, you may e-mail your request (including the order reference number) to Customer Support. If you are unable to provide your order reference number, be sure to include the exact name and complete shipping address that was specified on your order. To check the status of orders placed by mail, phone, or fax, e-mail Customer Support to verify that your order was received and shipped. Include the exact name and complete shipping address that was specified on your order. Orders from the U.S. and Canada are normally shipped via a traceable method, which requires a street address. This allows us to track your package in the event of a problem or delay. International orders may be shipped to a P.O. box if you request Regular service (which is not a traceable shipping method). All expedited international shipments require a street address. If you are unable to provide a street address, your order may be delayed. Someone should be available at the street address to receive and sign for the package. (If no one will be available to receive the package, indicate "no signature required" in the "Questions/Comments" text box on your online Order Form.) However, it is entirely at the discretion of the individual who delivers your package to decide whether or not it is safe to leave your package without a signature. In most cases, the shipping company will attempt delivery of your package three times before returning the package to PAR. Will I have to pay any additional charges when my package is delivered? All packages are shipped VAT-collect. For expedited service to Canada and other international destinations (depending on the country and/or region), additional customs and/or duties may be assessed. PAR offers same-day shipping for all orders received Monday through Friday by 6:00 p.m., EST. Orders received after 6:00 p.m., or on weekends or holidays, will be shipped the next regular business day. Products are rarely out of stock, but if the item you are ordering is not in stock, you will be notified. All orders are shipped from our distribution center in Lutz, Florida (33549). PAR offers competitive shipping and handling rates, as well as expedited delivery options. Estimated shipping times are listed below. We also offer 2-Day Air, Standard Overnight, and Priority Overnight shipping. Customers are responsible for all duties and taxes. Can I download any of your software programs directly from your website? PAR is happy to offer many of our popular software programs in a downloadable format. These downloadable programs are identical to the CD-ROM versions. When you purchase a downloadable program, your serial number and a link to download your software will be e-mailed to you as soon as you complete your order. Our downloadable software products do not include any test forms. Software downloads are listed along with their product’s other items, including regular software. If you would like to purchase an upgrade or conversion for any of the programs available for download, please contact our Technical Support Department directly at 1.800.899.8378. How can I re-install my downloaded software if I have computer problems? Simply sign in to our website using the email address and password associated with the Software Download purchase. Then click on “My Account” and select “View Software Downloads.” This page includes the serial number and a download link for any software downloads you have purchased. How does the licensing work for Software Downloads? The licensing works the same way as it does with our other programs. Each software license (purchase) is limited to a single user at any given time. The license can be tied to a single computer by installing the software locally, or it can be shared among multiple users by installing it to a network share. When a shared license is in use, other users attempting to run the program will be notified that it is temporarily unavailable. If simultaneous access is required, we recommend that you purchase multiple copies and install them in different locations. I have an older version of an existing program and would like to download an upgrade or conversion. Is this possible? Some of our upgrades and conversions are available for download. However, these can’t be ordered through our website. Please contact our Technical Support department at 1.800.899.8378 to inquire if the program you need is available for download. Is the software I’ll receive identical to the CD-ROM version of the program? Yes. It is exactly the same software, available for download instead of using a CD. For more information about our software, please see our Technical Support or PAR Software FAQs. What is the advantage to buying a software download instead of the CD-ROM version? There are two main advantages to buying a download instead of the CD-ROM version of a program. The first is that you will not have to wait for the CD to arrive; you can download and install the software as soon as you’ve completed your order. The second advantage is that you save on shipping charges, as we do not charge shipping on software downloads. What is the process for installing a downloaded software program? Once you place your order, you will receive an e-mail with instructions, a Quick Start Guide, a link to download the software, and your serial number. Once you download the software to your computer, you will run the Setup.exe file and follow the on-screen instructions. Our Technical Support Specialists are available Monday through Friday from 8:00 a.m. to 6:30 p.m., EST. E-mail: Our Technical Support contact form will allow you to provide information we need to assist you quickly. If you are using our software, please be sure to include any error message(s) you received and describe what you were doing when you got the error message(s). Phone: Toll-free 1.800.899.8378 (U.S. & Canada). All others, phone 1.813.449.4066. When contacting us by phone, please be seated at your computer and have the original program disks with you. Are PAR software products Windows® 7 and Vista® compatible? Please click here to find out if the version of PAR software you are using is compatible with Windows XP, 7, 8, and/or 10. Most of our programs have been updated to work on Windows Vista. To see if a specific program is Vista compatible, please check the Requirements section on the product page. If you have any additional questions, please contact our Technical Support Department at 1.800.899.8378 or via e-mail through our Technical Support contact form. Do you sell software for the Macintosh platform? PAR proprietary software is developed for the PC (Windows®) platform. If you wish to verify whether one of our software programs will be compatible with your system, review the requirements specified for that program in our online product catalog. If you still have questions regarding the use of the product with your PC, see the PAR Software FAQ page or e-mail Technical Support. I lost my disc and I need to reinstall my software. What should I do? Contact our Technical Support to obtain instructions for obtaining a replacement disc for the one you lost. After verification of your original purchase, we can replace your lost disc for a nominal fee, or you may be eligible for a reduced-cost software upgrade. Can I make a backup copy of my software to keep in case something happens to my computer? Most PAR software products are copy-protected and cannot be copied. In the event of a hard drive crash or system failure, the majority of our software products include a backup/second installation. In the event that you do not have a backup installation, please contact Technical Support for assistance. Does PAR provide free technical support? PAR provides free technical support for all the products we sell (print and software). Our Technical Support Specialists have extensive product knowledge and direct access to both programming and product development staff for prompt and accurate answers to your questions. Do you offer product demonstrations so I can evaluate a software product before I purchase it? PAR does not provide demonstration versions of our software. However, we do offer a 45-day No-Risk return policy. To preview sample reports for our software products, visit the product page and click on the sample reports links in the Supplemental Product Resources section. Will I be notified if you release any updates or upgrades to a software product I purchase? Updates are small changes that do not effect the program features. PAR Customers will be notified of any updates deemed critical to the use of a program. All PAR software updates are available for download from the Software Downloads section of this website. Complete instructions are provided on-screen. Upgrades are significant changes in either the decision rules of the program or the program features. With an upgrade, the version number of the program changes (e.g., from Version 1 to Version 2). Upgrade announcements are sent to purchasers of the earlier version. Upgrades are also announced in both our online product catalog and our print catalog. You may upgrade from an earlier version of the program at a cost that is significantly less than the price of the new version. If you purchased the previous version within 90 days of the release of the upgrade, you are eligible to receive the new version at no cost. If I purchase prepaid Professional Report Service Answer Sheets, will there be any additional processing charges? The cost of the Answer Sheets includes first-class postage to cover the return of the report(s) to you. If you prefer expedited return service for your reports, there is an additional shipping charge as listed on the Control Sheet. If you need a copy of the Control Sheet, we will be happy to fax or e-mail one to you. Simply contact Customer Support.